If you are planning on booking one of our villas you may have a few queries that you would like to clear up before you arrive. Such as where to get the best exchange rate, what are the shop opening hours and what to do in the event of an emergency, so here goes. Banks Generally open from 9.00am until 14.00pm, Monday to Friday. All banks can exchange your sterling for Euros and generally speaking you are likely to get a better rate here than if you exchange your money before leaving the UK. You will need to present your passport in order to process the transaction. Some banks charge commission – ask before making the transaction. There are several cash point machines in the town of playa blanca. A number of shops in the town cente – especially those selling electrical goods offer an exchange facility. Christmas/ New Year Most supermarkets and restaurants in the town open as per normal throughout the Christmas period. Opening days and times will be displayed at each supermarket and restaurant. Crossing Roads Unlike the UK, drivers in Lanzarote are not obliged to stop for you at pedestrian crossings. So don´t step out and expect them to stop. Wait for a break in the traffic instead. Driving Even though cars are driven on the opposite side of the road, the laws governing driving in Lanzarote are much the same as in the UK. There is strict adherence to wearing a seatbelt, no mobile phones are to be used whilst driving and under no circumstances is drink driving tolerated (blood limit 0.08%). All offenders on the last rule face on the spot fines and mandatory prison sentences. Duty-Free Check what your allowance is for going home. Everything you buy on the island must be within the limits set by customs. Duty-free cigarettes, alcohol and perfumes are cheaper on the island than in the airports. Electricity The electricity is a 220 volt supply with continental twin plugs. Please remember to bring an adaptor when bringing any electrical items with you. Should you forget, these are readily available in most supermarkets. You will find traversing through the airport quick and painless, you will be sitting around the pool with your first drink in no time a all. For all emergencies call 112. You will be put through to the police, ambulance service or fire brigade. The emergency services, besides attending the calls in Spanish, also use English. Mosquitoes As in most hot countries mosquitoes and are present and can be a nuisance. But unless you are allergic that’s all they are really and can usually be dealt with by use of mosquito repellant and plug-ins. Some people swear that avoiding perfume or aftershave puts biters off the scent. Post Office The post office in the town is open from 09.00 to 14.00 hrs and close an hour earlier on Saturdays. Stamps can be purchased here for your postcards. 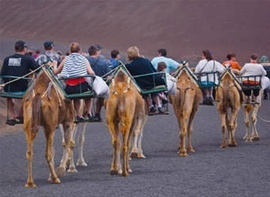 The postal service is quite laid-back so if you have important or urgent mail, Lanzarote recommends you use an international courier company. Reading Material Bring plenty to read, don't forget you'll be spending a lot of time by the pool or on the beach and foreign magazines and books are a bit expensive in Lanzarote. Taxis These are very efficient, but are not bookable in advance. A list of taxi numbers will be available at the villas. Taxis are metered, the approx cost from our villas to the town/beach per cab is 3.50 euros. Bring your driving license if you have one, even if you don't plan on hiring a car. It's not heavy, doesn't take up space and you may find yourself deciding to hire a car after all as you discover how much there is to see around the island, once you're here. Telephone Code If calling a Lanzarote number from either the UK or Ireland you will need to add the prefix 0034. Time Lanzarote runs on Greenwich Mean Time. So there is no need to adjust your watch. The Canary Islands use the 24-hr clock as opposed to 12 hours, using am and pm. Vaccinations No inoculations are required. Visas EU passport holders do not need a visa to enter Lanzarote. Water Whilst water is hygenically safe for cleaning teeth, washing food etc... it is very high in mineral content which can cause bad stomaches so for drinking water, buy bottled water from any supermarket. All ice cubes here are made from mineral water too, so safe to consume. Please do not drink from public fountains or public spouts.